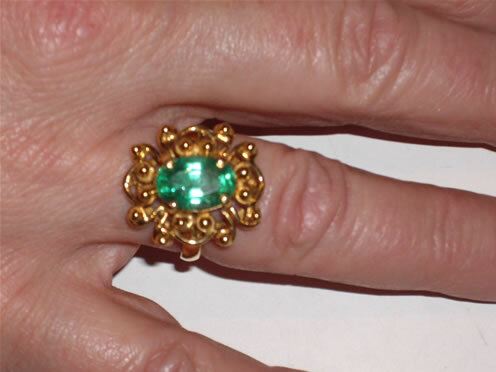 Gems Too specializes in genuine gemstone jewelry (diamonds, tanzanites, emeralds, sapphires, ruby, moissanites, etc.) 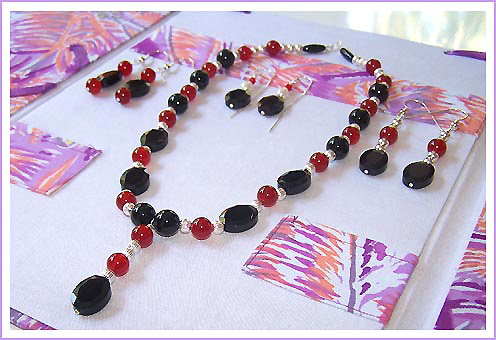 and has an extensive inventory of custom made pieces and rings, necklaces, earrings, bracelets, pins and pendants. 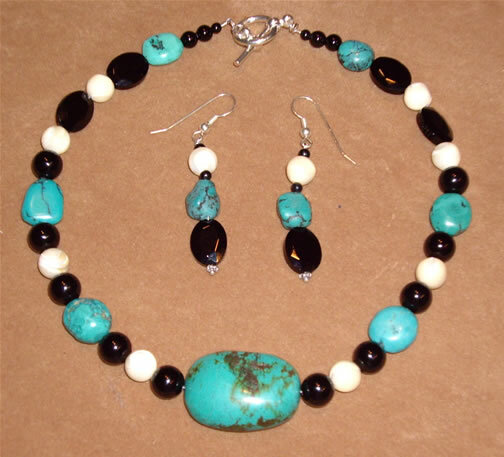 All of our jewelry designs are original one of a kind pieces. 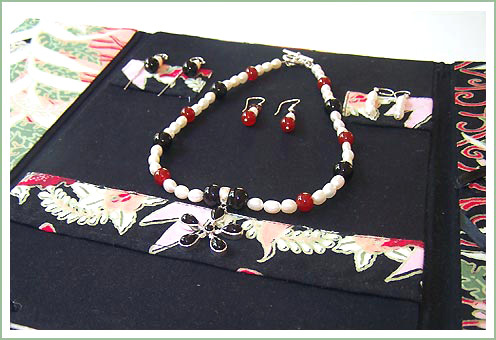 All pieces can be purchased separately. 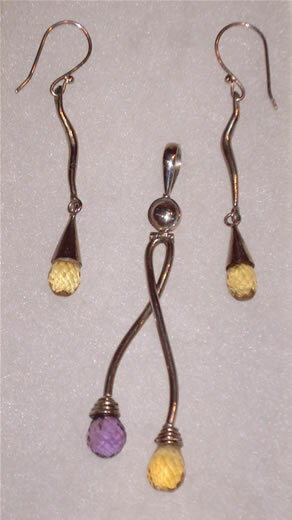 For example a pendant can be purchased without the earrings. 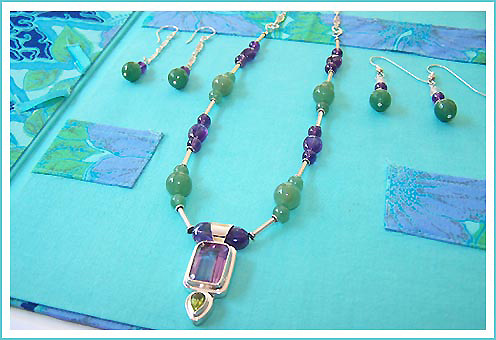 All jewelry is set in .925 Sterling Silver unless specified as gold or platinum. The pictures don't always do the piece justice. 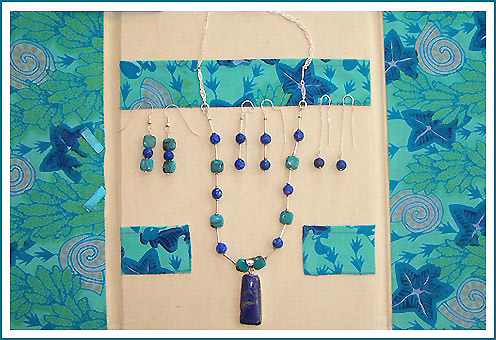 All of the set gemstones pieces were custom designed by us and the designs were hand crafted by the skilled artisans in Bali. 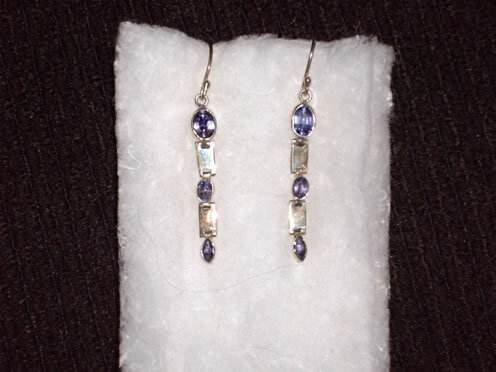 #1 Outstanding Earrings 1 3/4" long with Amethysts and Blue Topaz. 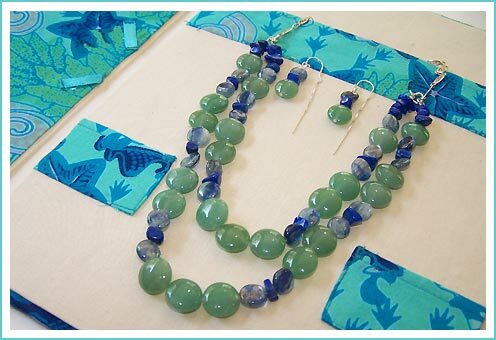 Gemstones are beautiful. 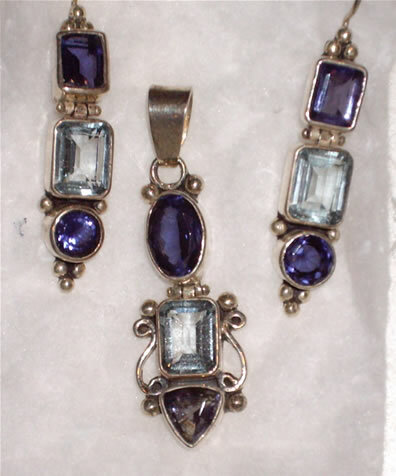 Over 14 carats of Amethysts and 3.3 carats of Blue Topaz. #2 Earrings: 2" long. Pendant: 2 1/4" long. 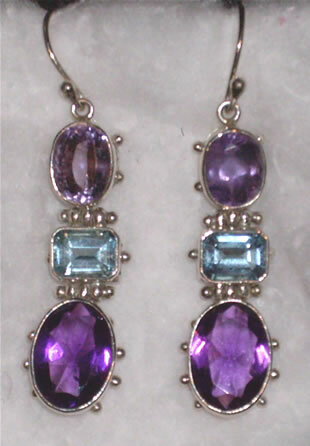 The earrings contain 2.60 carats of Amethysts and 9.5 carats in 4 Aquamarines. 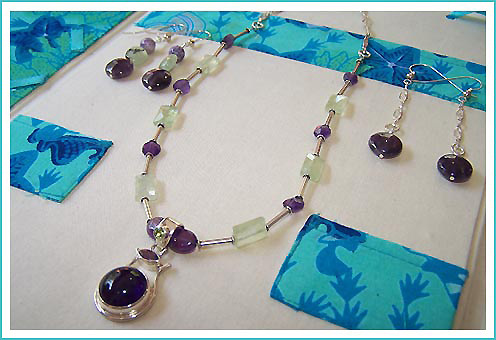 The pendant contains 1.41 carats of Amethyst and 5.53 carats of Aquamarines. Oh So Beautiful. 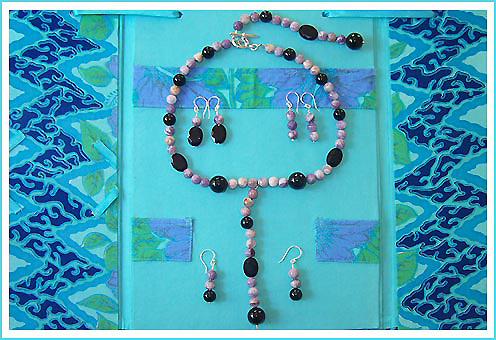 #3 Earrings - 1 1/4" long. 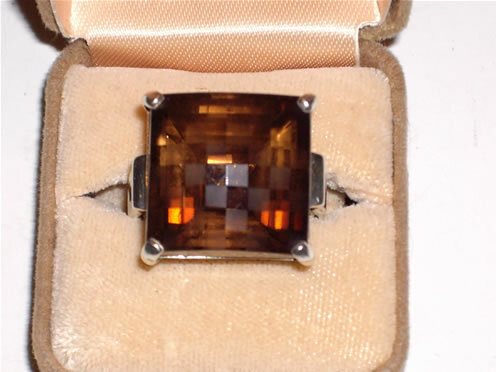 Checkerboard Blue Topaz are each 7.5 carats. 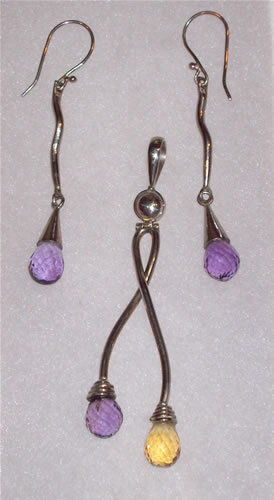 The two Amethysts are 3 carats. 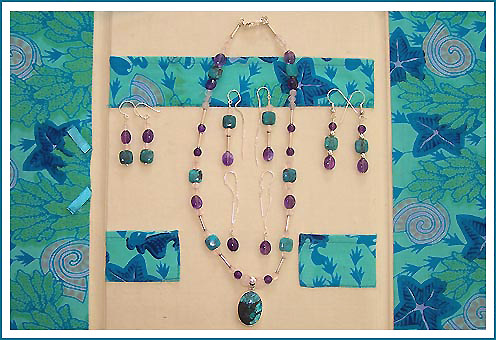 #4 Earrings - 1 1/2" long. 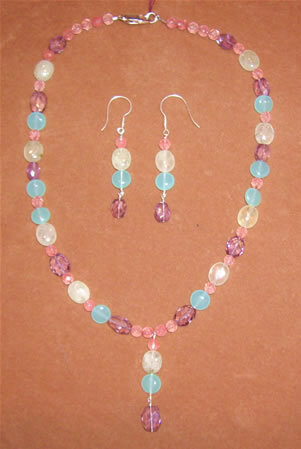 Opals are vibrant with lots of color and over 3.5 carats. Oval Blue Topaz are deep blue and are 3.3 carats total. 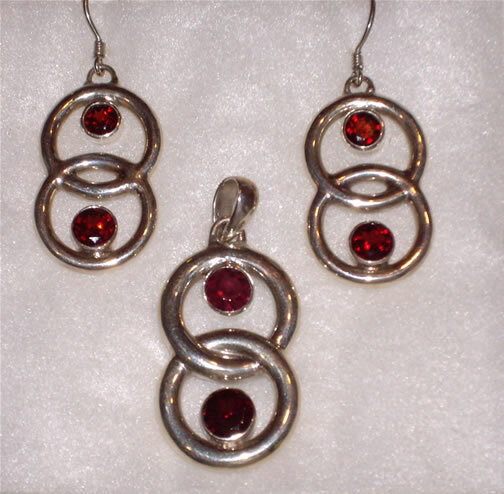 #5 Contemporary Earrings and Pendant in heavy sterling silver and sparkling garnets. 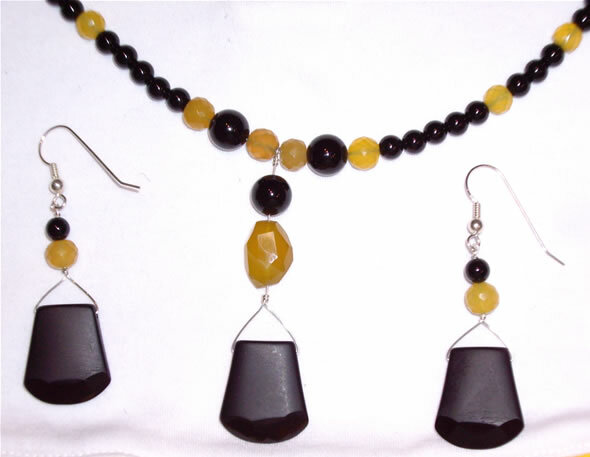 Earrings contain 4.75 carats of garnets and pendant contains 4.11 carats of garnets. 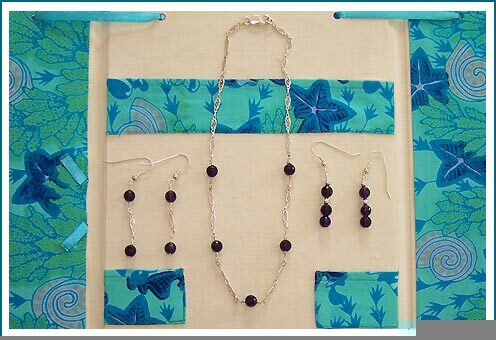 Earrings are 1 1/2" long and contain 2.25 carat of Zircons, 4.10 carats of Blue Topaz, and 3.41 carats of Garnets. 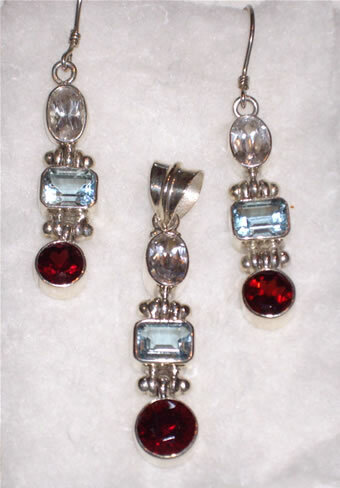 Pendant is 2" long and contains 2.09 carats of Zircon, 1.66 carats of Blue Topaz, and 3 carats of Garnet. 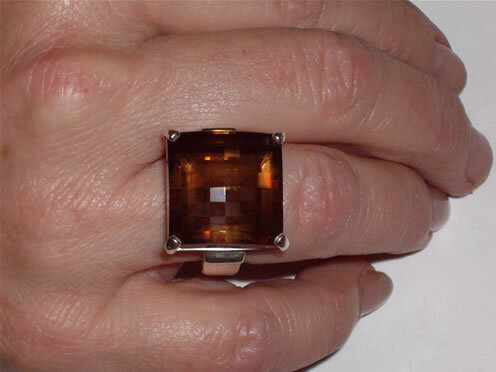 Note: Zircon is a genuine gemstone and should not be confused with cubic zirconia. 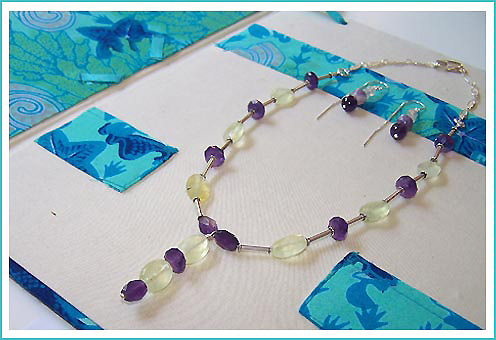 #7 Wishbone Pendant is 3" long with a faceted briolette Amethyst and a faceted briolette citrine. 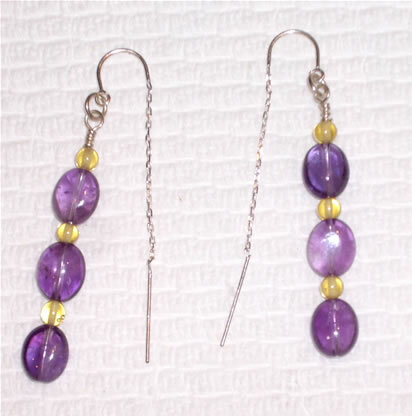 Matching curved earrings are 2" long with faceted briolette Amethysts. 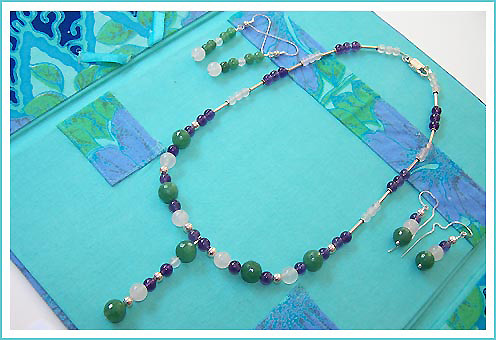 I purchased the briolette gemstones when I was in India this year. 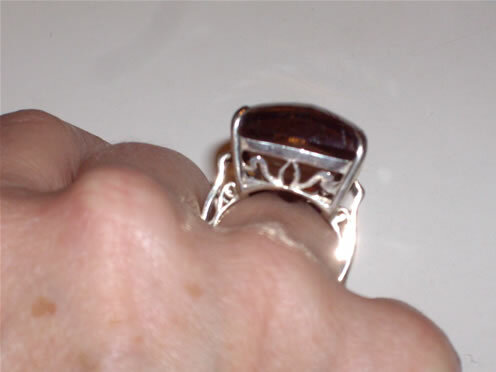 Silver in the photo looks dark but it's just the photo - normal sterling silver. 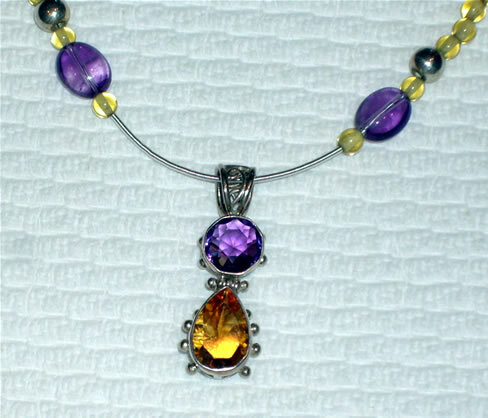 #8 Wishbone Pendant is 3" long with a faceted briolette Amethyst and a faceted briolette citrine. 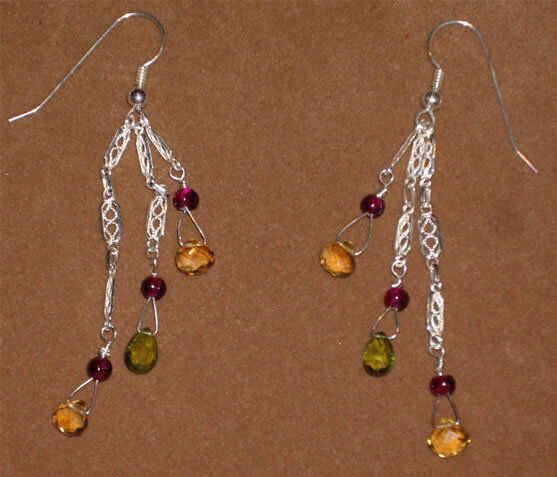 Matching curved earrings are 2" long with faceted briolette Citrines. 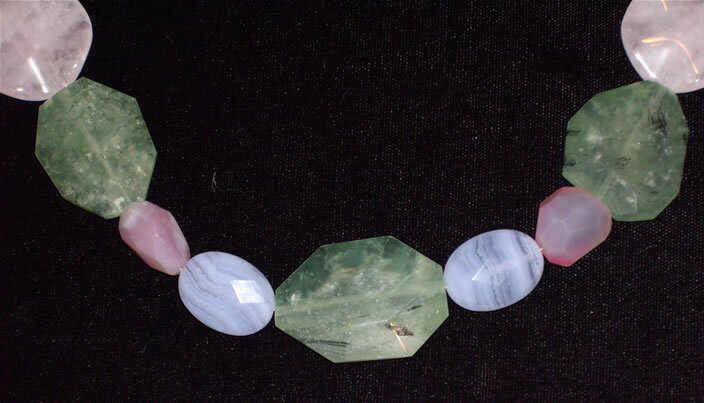 #9 Necklace is 15 1/2" long with a 1 1/2" faceted Sapphire drop. 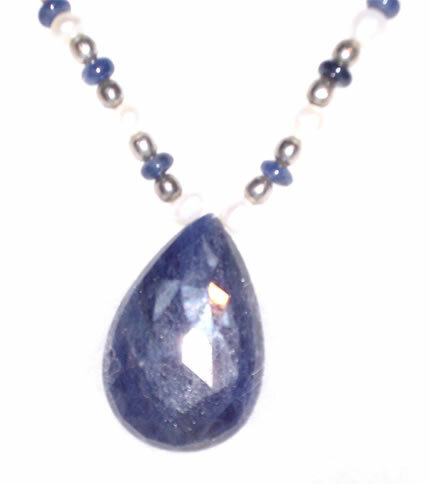 The Sapphire drop is over 75 carats. 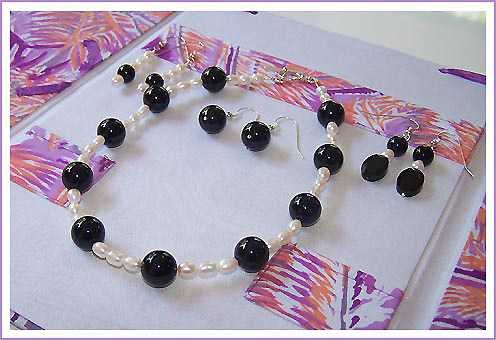 Remainder of necklace is Sterling, Pearls and Sapphire Rondelles. 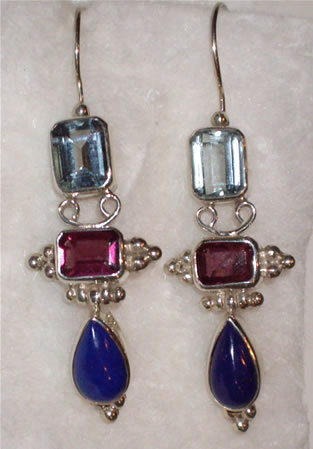 Earrings are 1 1/4" long with over 60 carats of faceted Sapphires in Sterling Silver. 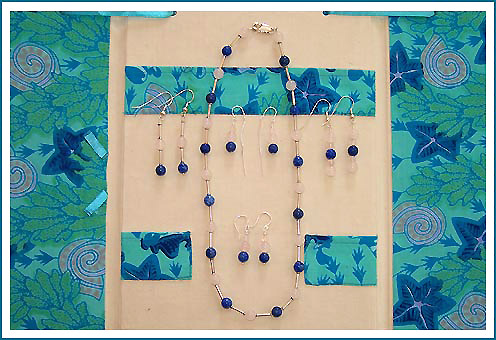 #10 Pendant and Earrings with Iolites and beautiful Aquamarines. 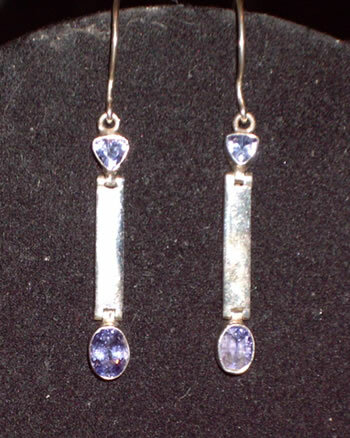 Iolites closely resemble more expensive Tanzanites. 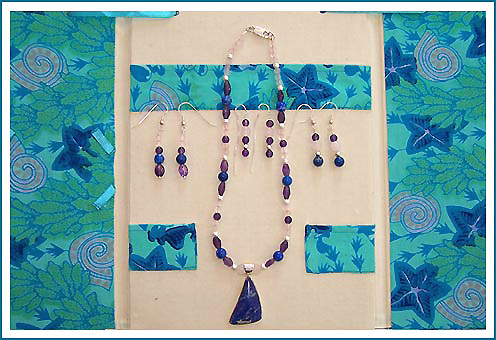 We do have an extensive collection of set and unset Tanzanites in small and large sizes direct from Arusha, Tanzania. 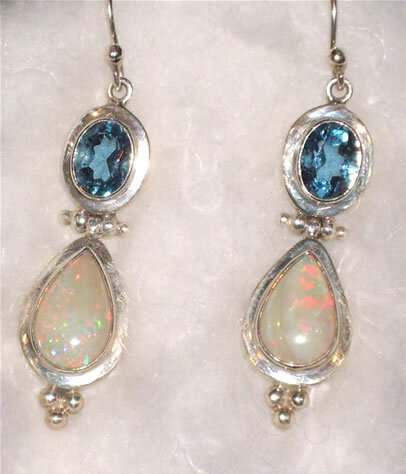 Earrings: 1 1/4" long with 3 carats of Iolites and 4.79 carats of Aquamarines. Pendant: 1 3/4" long with approximately 11 carats of Iolites and 4.5 carats of Aquamarines. 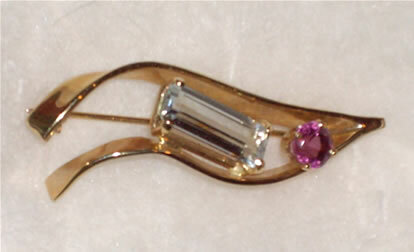 Pendant is 1 1/2" long with a more than 3 carat pear shaped Citrine and a 1.5 carat Amethyst. 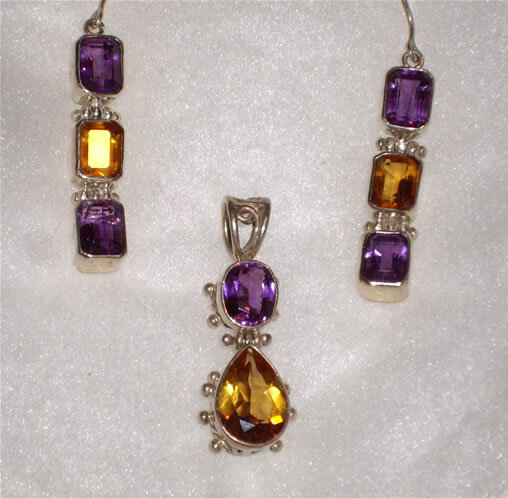 Earrings are 1 1/4" long with a total of 9.5 carats of Amethysts and 3.62 carats of Citrines. 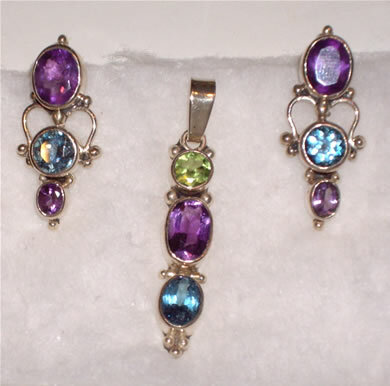 Pendant is 1 3/4" inches long with a 1 carat Peridot, 2+ carats of Amethyst, 1.5 carats of Blue Topaz. 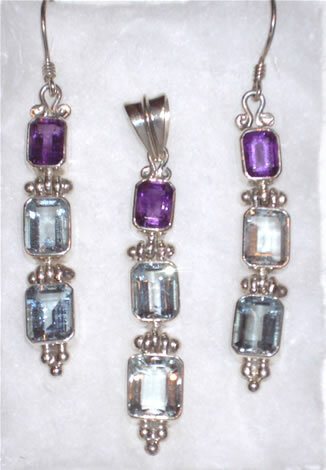 Earrings are 1 1/4" long with 5 carats of Amethyst, 2+ carats of Blue Topaz and 1+ carats for the bottom Amethysts. 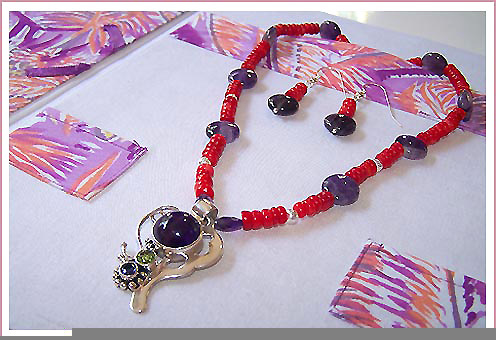 Necklace is 18" long with a 1 1/2" pendant of Citrine, Amethyst, Sterling Beads and Sterling French Wire. 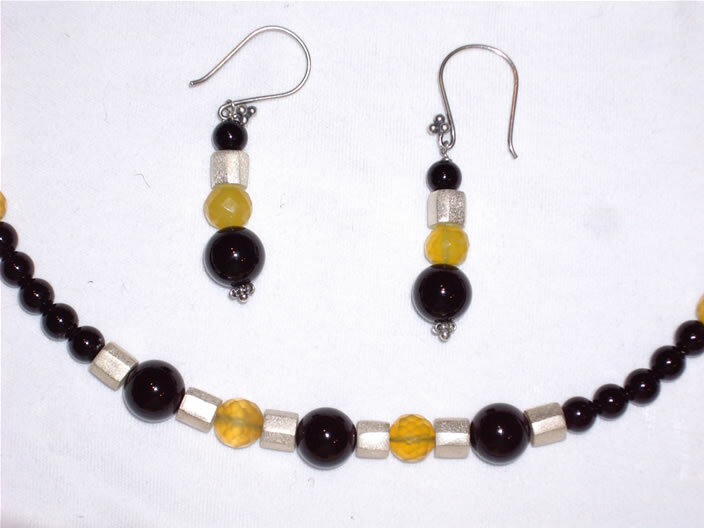 Earrings are 2 1'4" long with Amethyst and Citrine with easy to wear and stylish ear threaders. #14 A Show Stopper! 3.29 carat Emerald from Hiddonite Emerald Mine in North Carolina. Set in Bali in traditional Balinese style in 18k gold. 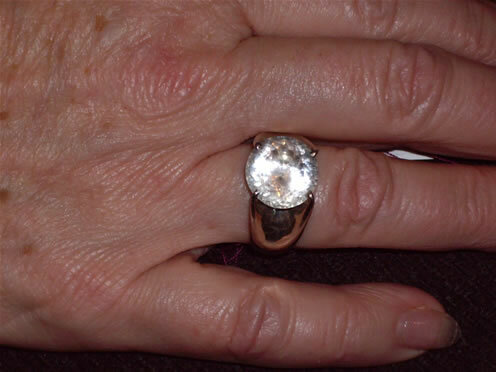 Size is 8 1/2 but we'll have it resized to your size at no additional cost to you. 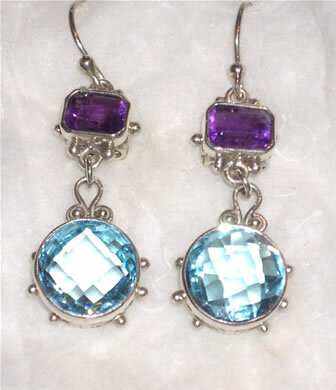 #15 Tanzanite Earrings are 1 1/4" long with over 2 carats of oval and trilliant cut Tanzanites. Photo angle/reflection makes the silver look dark, but it's normal Sterling Silver. These really look pretty on. 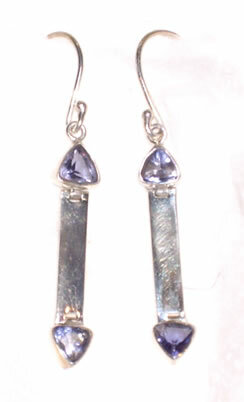 #16 Tanzanite Earrings in Sterling Silver. 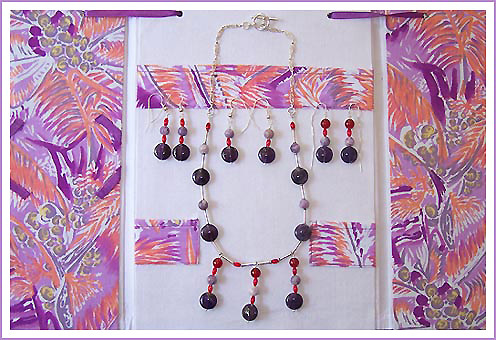 Earrings are 1 1/2" long and contain over 2 carats of Tanzanites we brought back from Arusha, Tanzania. 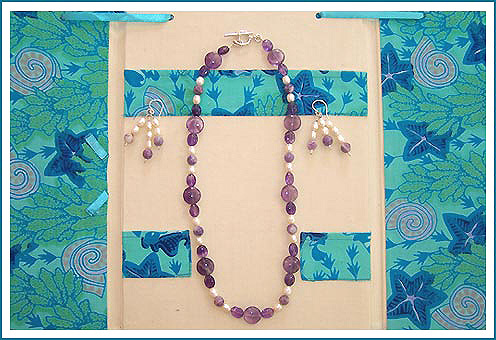 #17 Iolite Earings are 1 1/2" long and contain a total of 1.60 carats of Iolites set in Sterling Silver. 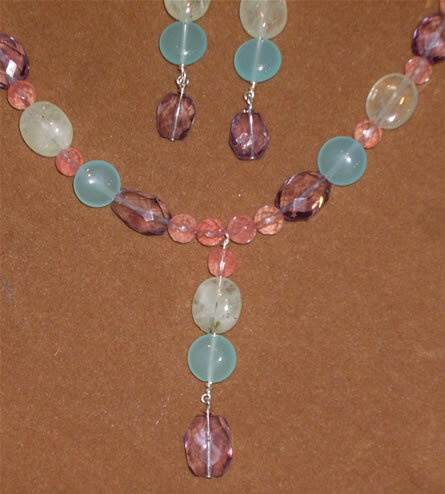 #18 Gorgeous faceted Kunzite (total of 12 carats) and Blue Topaz (15 carats) are 1 1/2" long. One of my Personal Favorites. 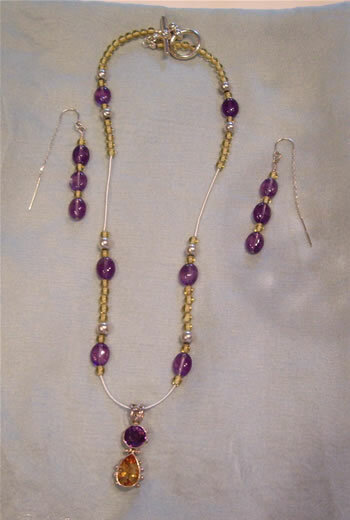 #19 Pendant and Earrings. 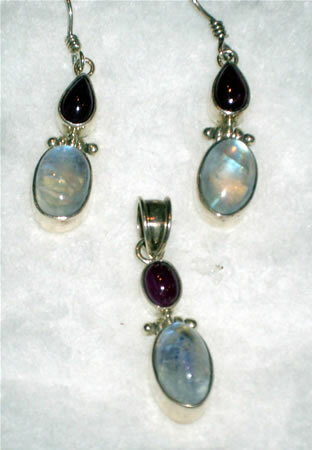 Cabachon Rubies and Rainbow Moonstones. Rubies appear darker than they actually are. 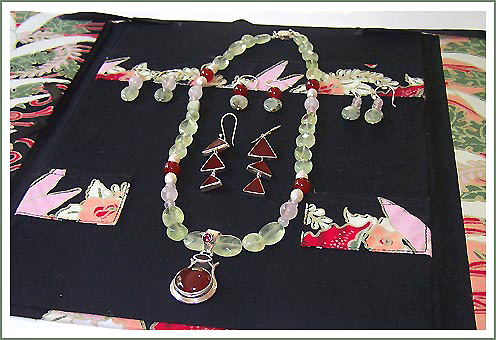 The pendant is 1 1/2" long and the earrings are 1 1/2" long. 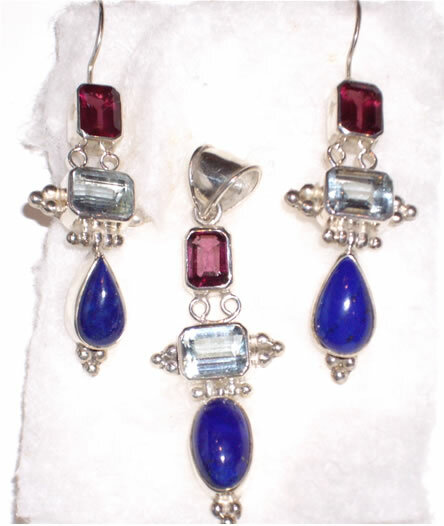 Earrings are 2" long and contain a total of 3.5 carats of Garnets, 4 carats of Aquamarine and approximately 3 carats of Lapis Lazuli. 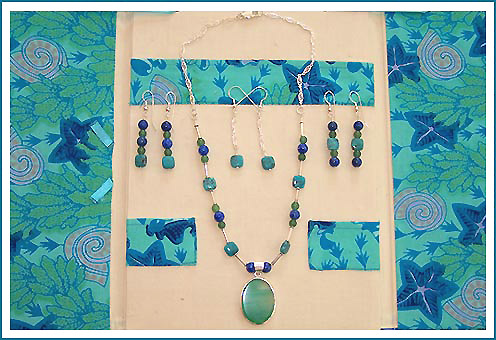 The Pendant is 2" long and contains 2 carats of Aquamarine, 1.67 carats of Garnet, and approximately 2.5 carats of Lapis Lazuli. 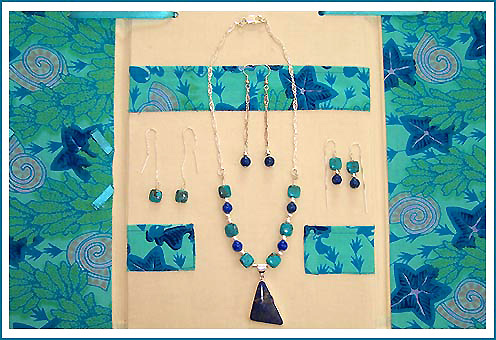 The matching Earrings are 2" long and contain 3.5 carats of Garnets, 4 carats of aquamarine and approximately 2.5 carats of Lapis Lazuli. #22 This item can be used as a Pin or a Pendant. 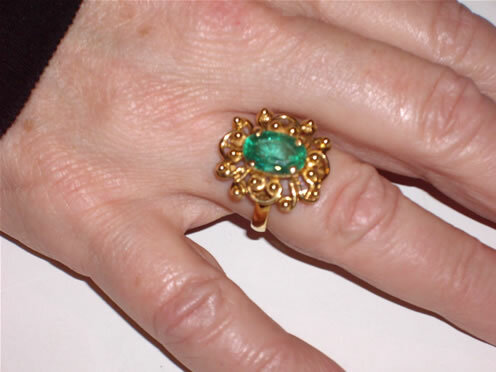 It is 14k gold, is 1 3/4" long and contains a 2 carat Aquamarine and a .93 carat Garnet. 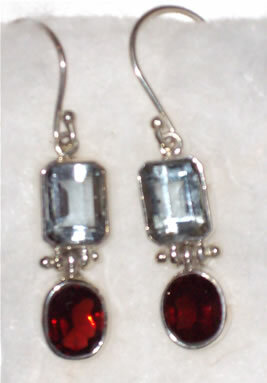 #23 These Earrings are 1" long and contain a total of 4 carats of Aquamarines and 4.36 carats of Garnets. 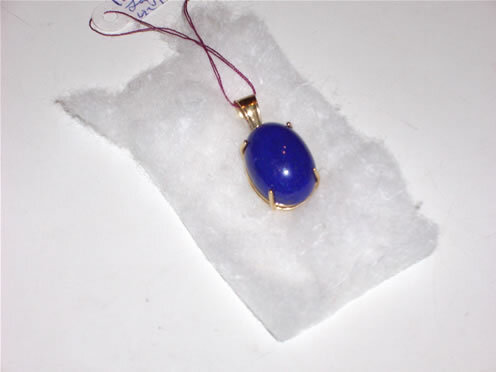 #23A Lapis Lazuli Pendant in 14k gold. The lapis is 12.30 carats and is 1" long. 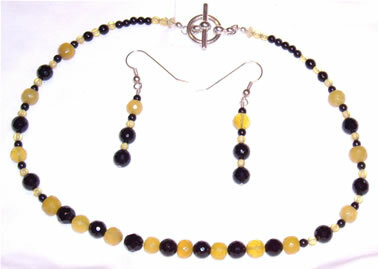 The Pendant is 2 1/4" long and contains a total of 5.28 carats of Garnets and 4.5 carats of Citrine. 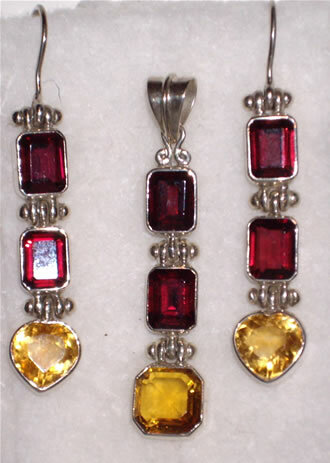 The Earrings are 1 3/4" long and contains a total of 7 carats of heart shaped Citrines and 10.5 carats of Garnets. 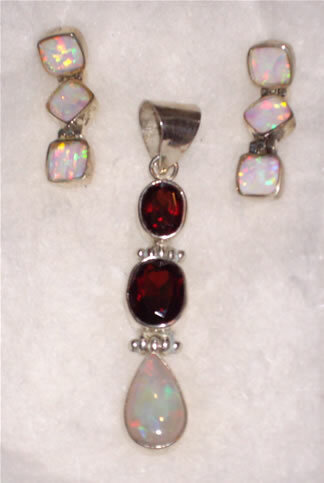 Pendant - 2" long with 4.12 carats of Garnets and a 1.76 Pear shaped Opal. 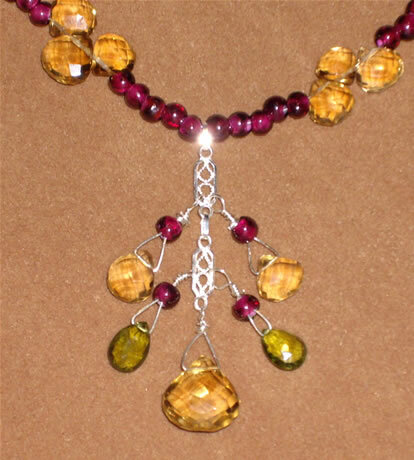 Pendant is 1 1/4" long with a 1 carat Trilliant cut Garnet and an approximately 5 carat Pear cut Citrine. 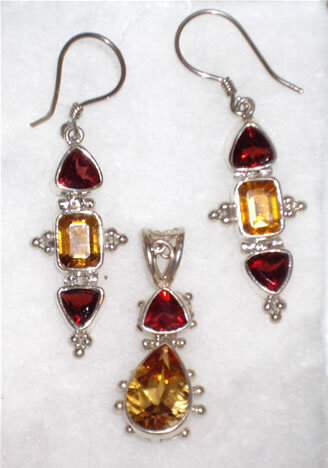 Earrings are 1 1/2" long and contain a total of 4.85 carats of Trilliant cut Garnets and 3.34 carats of Citrines. 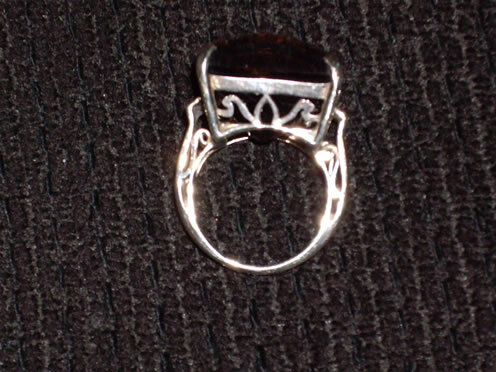 #28 This Ring is 44 carats of checkerboard cut Smoky Quartz in an Ornate Fretwork setting. 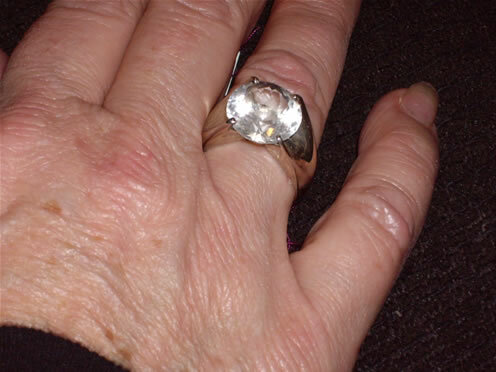 Size is 8 1/2 but could be resized. 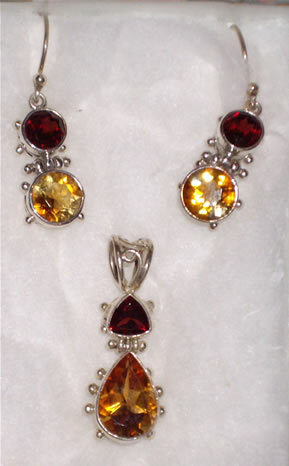 Pendant contains an approximately 5 carat Pear Cut Citrine and a 1.25 carat Trilliant cut Garnet. 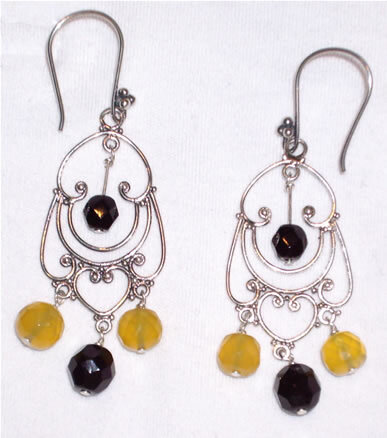 Earrings are 3/4" long and contain a total of 2.3 carats of Citrines and 2.5 Carats of Garnets. 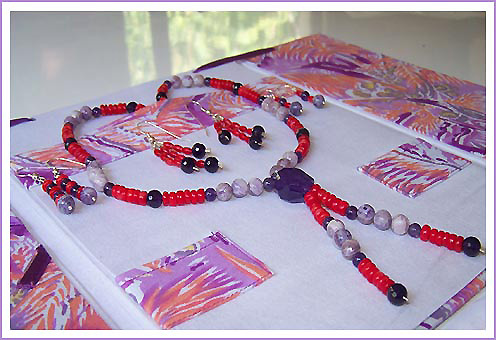 Necklace is 17.5" long and contains faceted briolettes we purchased in Nepal. 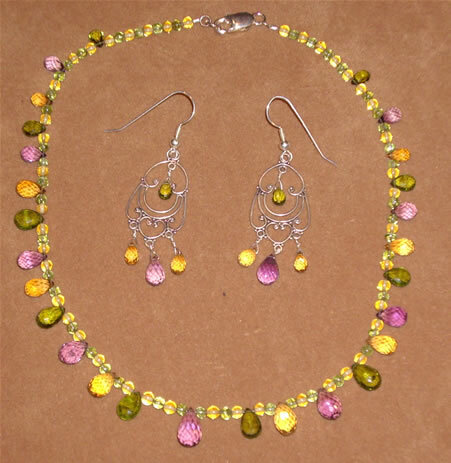 Necklace contains Amethysts, Citrines and Peridot briolettes with Citrine and Peridot balls. 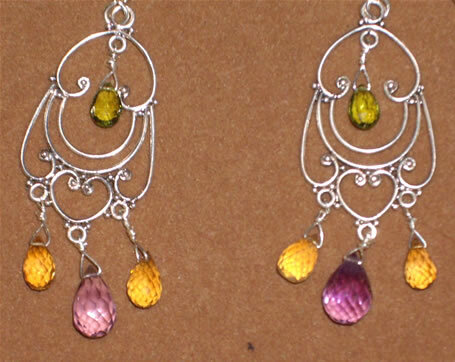 Chandelier Earrings are 2 1/4" long and contain Amethyst, Citrine and Peridot faceted briolettes. 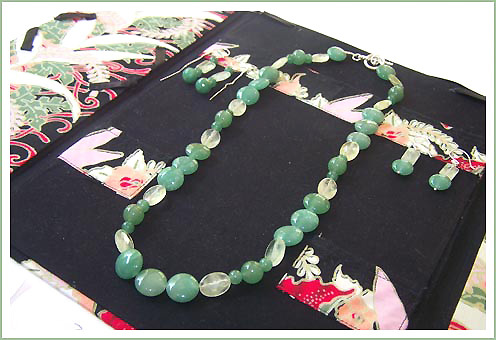 Necklace is 20" long with a 2" hangdown and contains Golden Topaz and Peridot facted briolettes we purchased in Nepal. 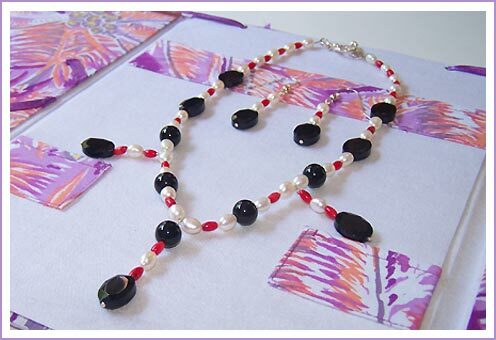 Necklace contains Garnet beads and sterling silver chain. 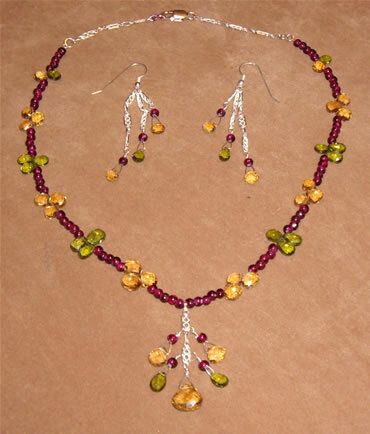 Earrings are 3" long and contain Garnet beads and Peridot and Golden Topaz briolettes. 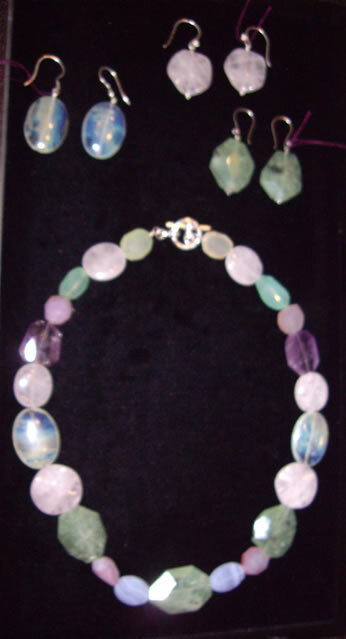 The Necklace is 22" long and contains Pastel Chalcedony, Apple Quartz, Prehnite, Ametrine, Blue Lace Agate & Rose Quartz. 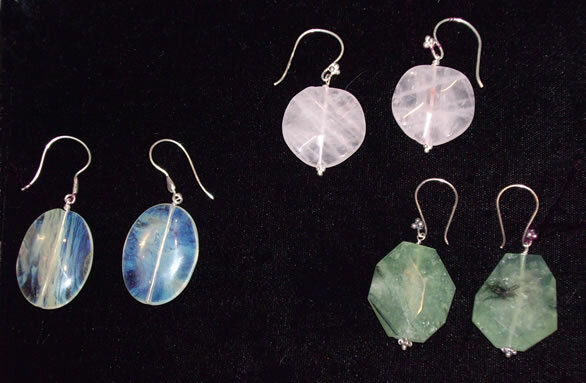 There are three different styles of earrings: One of Rose Quartz (1 14" long); one of Prehnite (1 1/2" long); and one of Apple Quartz (1 1/2" long). 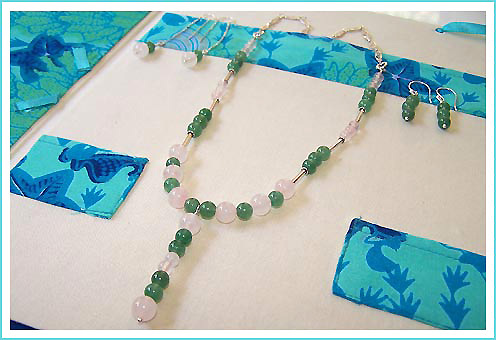 The Necklace is 16" long and contains Aquamarine Nuggets and Vintage Faux Pearls. 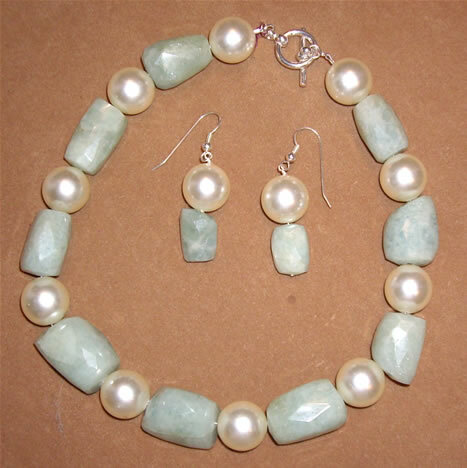 The Earrings are 2" long and contain Aquamarine Nuggets and Vintage Faux Pearls. 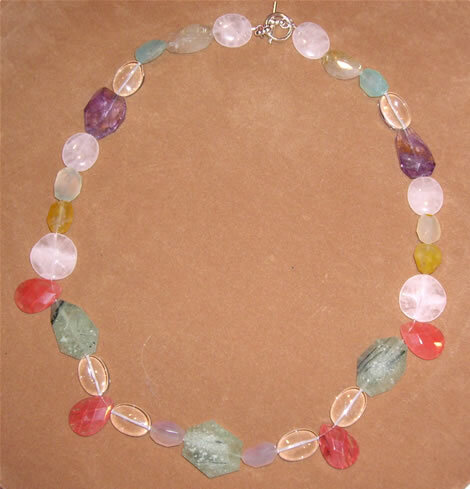 SOLD #34 This 24" Necklace contains pastel Chalcedony gemstones, Cherry Quartz, Ametrine, Rose Quartz, Prehnite, Rutilated Quartz and Clear Quartz. 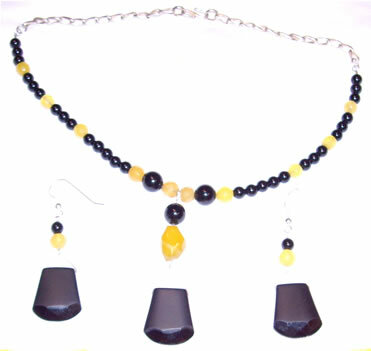 #35 Necklace and Earrings in Steelers colors. 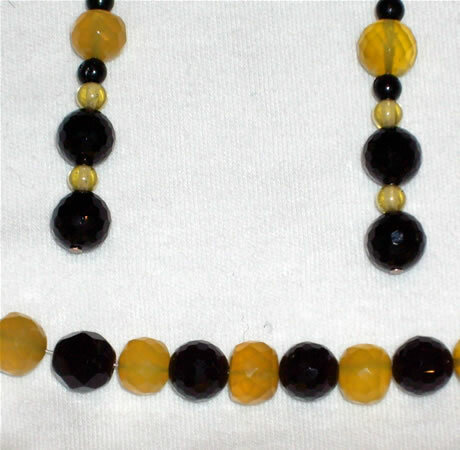 Necklace is 18" long and contains Onyx, Yellow Chalcedony, Honey Jade, Citrine and Jet. 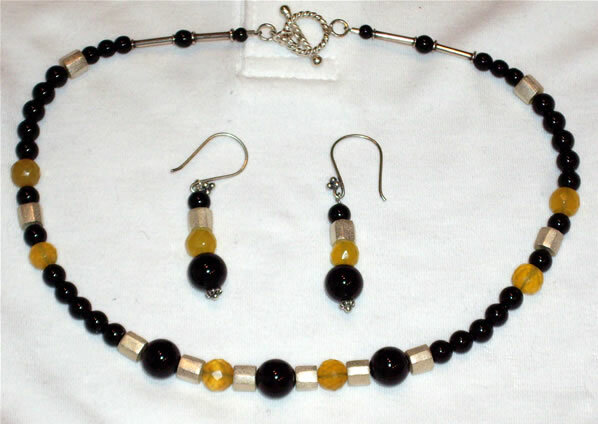 #36 Necklace and Earrings in Steelers colors. Earrings are 1 1/4" long. 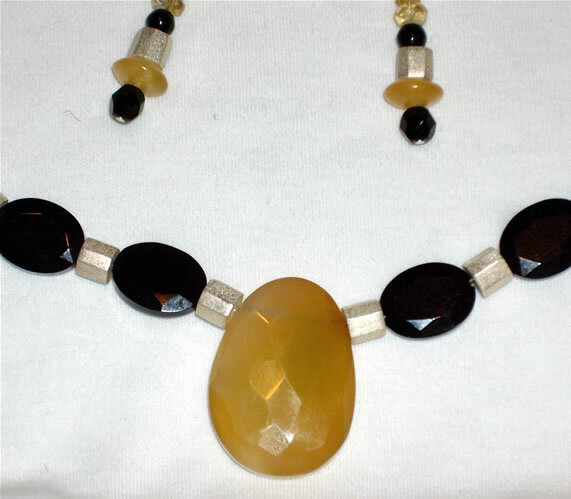 Necklace is 17" long and contains Yellow Chalcedony, Onyx, Jet and Citrine. 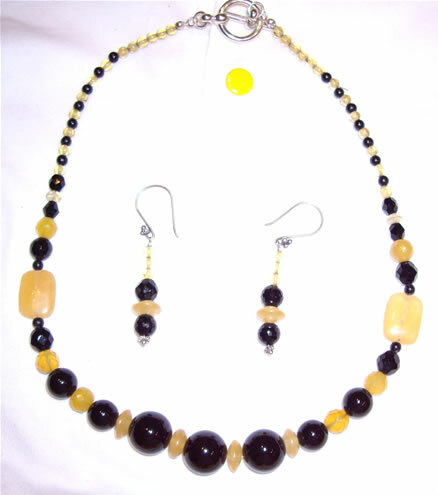 Necklace is 18" long (but is adjustable and can be shortened) with a 3" drop and contains Yellow Chalcedony, Onyx and Sterling chain. 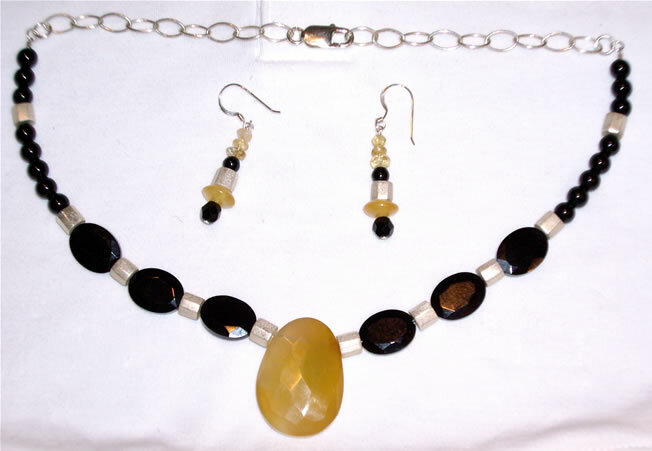 The Necklace is 18" long and contains a large Yellow Chalcedony center, Onyx and Brushed Silver beads. Earrings are 1 1/2" long. 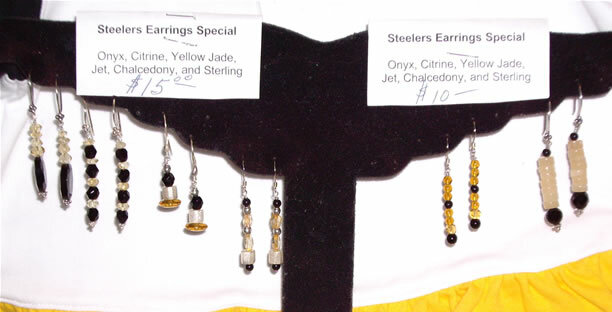 #40 Assorted Earrings in Steelers colors in Jet, Onyx, Chalcedony, and Citrine. 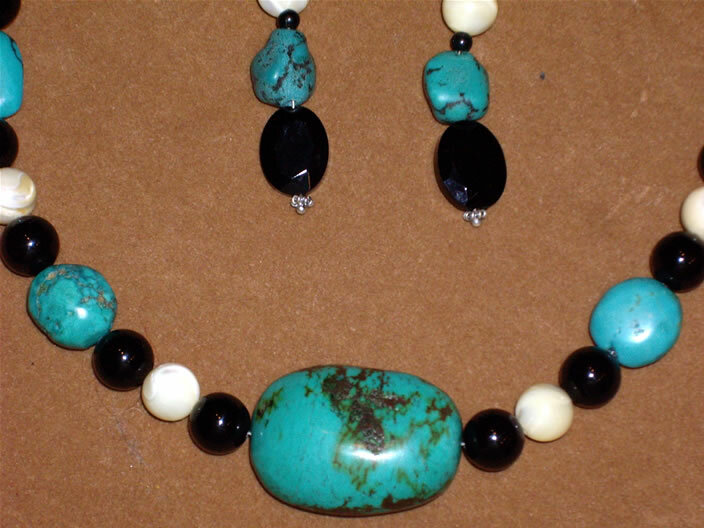 The Necklace is 17" long and contains Turquoise, Onyx and vintage Mother of Pearl. 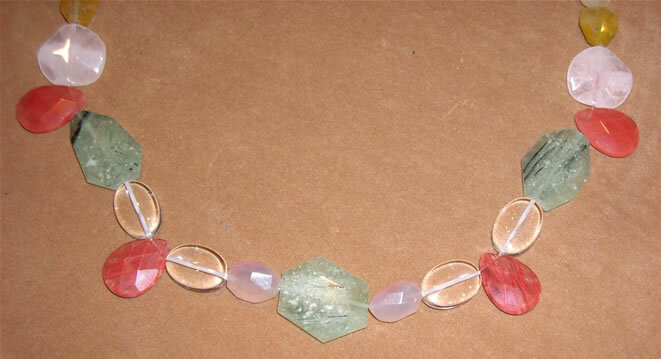 The Necklace is 18" long with a 3" drop and contains Amethyst, Prehnite, Chalcedony and Cherry Quartz. 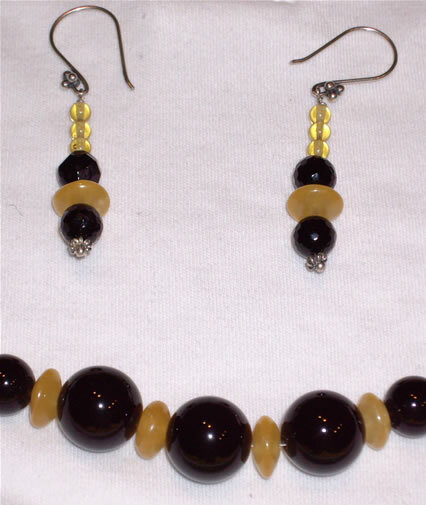 Earrings are 2 1/4" long and contain Jet and Yellow Chalcedony. 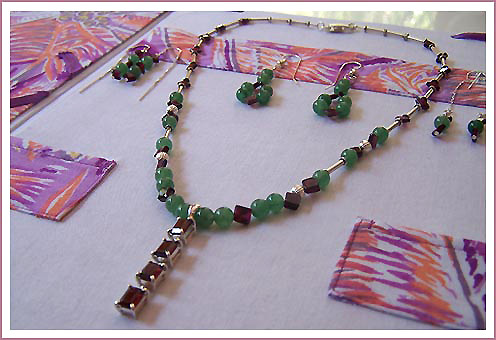 #Z32 - 18" long Necklace - Amethyst, Prehnite, Sterling Tubes, Chain with 2" Pendant with 2 amethysts and 1 peridot.